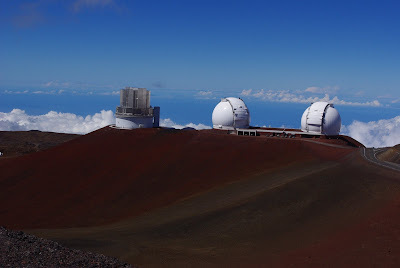 Mauna Kea is the highest mountain in the State of Hawaii, 4205m above sea level, 450m higher than Mt.Fuji. It is called White(Kea) mountain because its top becomes white with snow when winter. It is very famous, as there are many astronomical observatories on the summit. This photo was taken from the coast of Hilo. You look up 4200m so you see the Observatories just white spots. It is a beautiful gulf beach with sand little bit. Sometime Turtles swim with us. Many Observatories are there on top of it. Subaru has deferent form from others, leftmost, and Keck Ⅰ,Ⅱ, right side, are typical type. 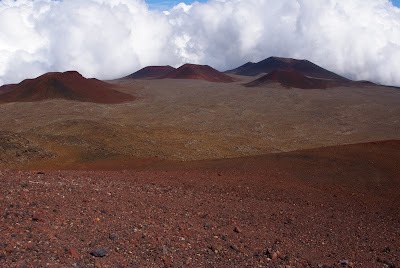 Many Scoria hills (cinder cone) are there in the Mauna Kea. Crater ejected so many lave balls and they were piled around there and made hill just like YONEDUKA in Aso Mt. and OOMUROYAMA in Izu peninsula. Distant view from the airplane. Mauna Loa is right of Kea, though it is 4165m high it looks like just a hill .